Legendary filmmaker Clint Eastwood has made a film about the true story of three young American heroes who overtook a terrorist while on a train to Paris. 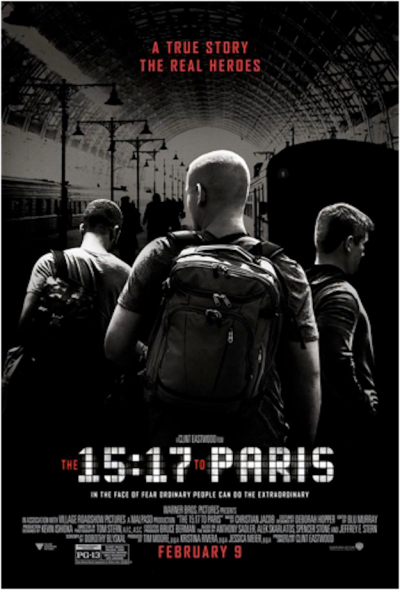 The film, "The 15:17 to Paris," showcases the faith and courage of three ordinary men whose extraordinary acts of heroism save hundreds of people's lives. "In the early evening of Aug. 21, 2015, the world watched in stunned silence as the media reported a thwarted terrorist attack on Thalys train No. 9364 bound for Paris — an attempt prevented by three courageous young Americans traveling through Europe," a description of the film states. "The film follows the course of the friends' lives, from the struggles in childhood through finding their footing in life, to the series of unlikely events leading up to the attack. "Throughout the harrowing ordeal, their friendship never wavers, making it their greatest weapon and allowing them to save the lives of more than 500 passengers on board." The motion picture will follow the account of Anthony Sadler, Oregon National Guardsman Alek Skarlatos, and U.S. Air Force Airman First Class Spencer Stone. Eastwood said he decided to ask the men if they would play themselves in the film instead of hiring actors. "The odds of our exact situation happening to us are too astronomical to believe that it was just purely chance; God had a hand in it," Skarlatos said in a statement shared with The Christian Post. Stone added, "I believe we're vessels, to be used by Him, to do His work. And it was an honor to do something that good." Sadler said, "I think it's our responsibility to take that message and be responsible with it and spread it as much as we can so we don't waste the opportunity that He gave us. We're meant to spread the story and it's meant to touch people." Sadler's father, Tony Sadler, is a Baptist pastor in Sacramento and believes the men's experience was all part of God's plan. "We believe God's providential will worked its way out. I'm just thankful they were there and got things done," he said in a statement shared with CP. In a behind-the-scenes clip of the film, Eastwood explains why he chose to highlight the everyday heroes. He also opened up about why he asked the men to play themselves on the silver screen. "It hasn't been a conscious choice to make movies about heroes, but this is an interesting story about regular people doing extraordinary things," Eastwood said. "I had looked at a lot of actors, good actors, but I was looking at the guys and I kept looking at their faces and finally one day I just said, do you guys think you could play yourselves?" he recalls. Hollywood actors Judy Greer, Tony Hale and Jenna Fischer also star in the film. Eastwood ("Sully," "American Sniper") directed and produced the movie which features a strong faith element. The Warner Bros. film hits theaters on Feb. 9.